Кери (Carrie) не е само производ, туку и услуга која овозможува следење и анализа на активностите на луѓе на кои што им е потребна грижа , насочена кон стари лица и лица со попреченост. Кери овозможува постојано следење во објектот каде што се одвива грижата, без разлика дали е индивидуален дом или пак место за заедничко домување. А може едноставно да кажеме дека грижата за нашите најблиски е најважна, а со т.н. „паметна“ технологија грижата сега е олеснета благодарение на проектот „ Кери“. Кери ја подобрува и поефтинува растечката потреба за грижа на стари лица, и лица со попреченост. Проблем со кој се соочуваат сите Европски и Северно-американски земји. Брзиот начин на живот не дозволува доволна грижа од семејството па се почесто се ослонуваме на грижа во домовите за стари лица. Нашата цел е да им помогнеме на другите сектори користејќи ја информатичката технологија да ги подобрат своите услуги, со тоа што ќе се овозможи подобра, поефтина, поквалитетна и постојана грижа на лицата на кои што им е најпотребна. In present time, and for long time in the future, the fulfillment of our societal duty is in question, we as a society must find new ways and solutions to provide the care our elderly population deserves. The care of elderly is complex problem with multi-fold facets. Rapidly increasing population over 65 who needed care, chronic lack of professional stuff, constant increasing the cost of care, overworked caregivers and strive for better care become more serious than ever. On behalf of the idea of better humanity, it’s our responsibility to handle these issues in the best possible manner. The world is continuously aging. According to United Nation, people aged 80 or over will dramatically increase, from 70 million in 2000 up to 153 million in 2025. The numbers are even more exponentially growing in developed countries. The ratio of retired members to workforce community increased, from 0.25 in 2010 to 0.29 in 2016, and it’s projected to increase exponentially to devastating 0.52 in 2070. This changes of demographics is changing the rules of the game that the Long Term Care (LTC) organizations are used to. LTC providers (facilities or care-at-home providers), the major institution of care, are facing issue for high demand of new and professional workforce. Yet, the less educated and unlicensed workforce is pushed towards caregiver carrier, job with high demands. This create costly high turnover of employees while pushing the licensed caregivers to overtime work. Quality of care is negatively affected by this issues. All this problems are driving the cost of care to constant rise which create fiscal problem for families and societies. The need for better care, cost increase and demographic change are growing the share of GDP allocated to LTC. This makes the LTC services to be not affordable for large group of older people. Seeing this challenges, we developed our product CARRIE which enables LTC organizations to provide better care and save their financial and human resources using single integrated system. 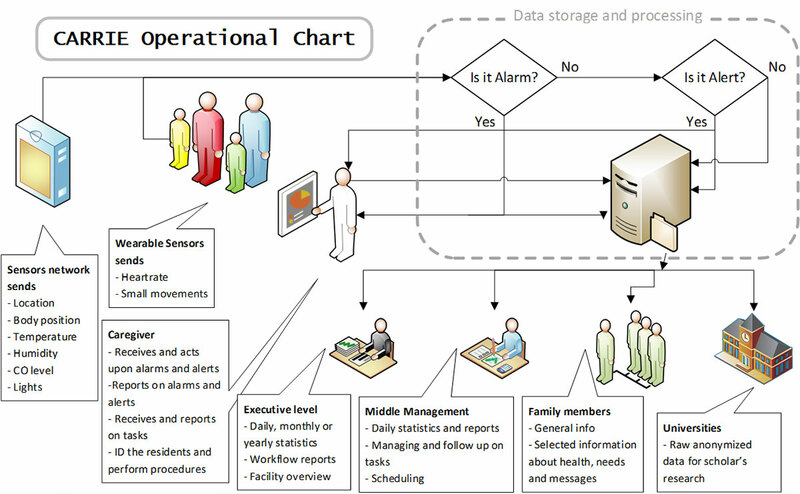 Caregivers will receive the right information instantly when they needed about resident’s state through alarms and alerts produced by Artificial Intelligence (AI) software, based on the data collected from sensor network (e.g. person fallen, irregular heart-rate etc.). The AI will also study the patterns in behavior of the residents and alert the caregiver in significant changes like longer sleep, shorter outdoor time, heart-rate out of range etc. This will help many health conditions to be prevented or treated timely. The LTC organization management will have automated resource management system that will appoint resources when and where they are needed with minimal downtime. Resource management and cutting the unneeded checkups in person will enable management to decrease the expenses of care while improving the services with using one integrated system. The final beneficiaries, the elderly, will benefit by having more independent life, not feel like a burden, and always sure that help will be on the way when they need it. The LTC organizations, private or public, are in constant need of cutting costs and trained stuff to fulfill their objectives. Gordian Sistemi is taking this business opportunity by offering CARRIE, a system that will generate savings on workforce and resources, and reduce the response time in case of accidents, by leasing it for a fraction of the savings. 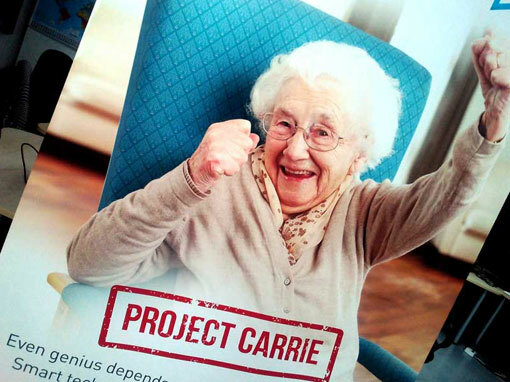 CARRIE will reduce the reliance on human workforce, optimized the use of resources and save money. By now we demonstrated the system at 3 organizations in Macedonia and all of them are satisfied with the results and waiting for the marketable version, we also have expression of interest from several LTC organizations from California, care-at-home provider from UK and Northern Ireland as well from organizations around Europe. During the phase-2 of the project we plan to bring the product to the market level, and we are negotiating with venture capital funds for financing the next phase and beginning of sale. At the moment we need finances for finishing the system development to marketable level, adapt it to different needs and promote and communicate the product to future customers. We are in contact with venture capital funds for go to market funding and growth. Our product is easily scalable by using local and international partners and licensing for different parts of the world. The anonymized raw data will be open for use by academic community for future researches, which results can be used for new solutions. The market for this solution is growing together with the problem, the technology in LTC specifically market in 2010 was worth $2.6 billion and grew to $4.4 billion in 2015. In only three years from now (2020) this market will be worth $10.3 billion and counting. The competition mainly consist of products covering just a niche of the problems, not interoperable among them creating headaches to the management. All of the contacted LTC organizations have stated that they will welcome integrated system interoperable with their existing technology. Our strong dedication and hard-work developing this product is guarantee that we are the company that can market and benefit from this product. We collected a core team that truly understands the problem, need and the solution, team that have in-depth knowledge of the long term care and the new technology, supported by fully equipped offices, lab and small production workshop. After all, we are excited to be on the road of potentially very profitable venture, but our commitment and dedication to this specific product is that we will help our parents, grandparents, relatives and neighbors to spend their senior years in peace and harmony.